The last sageuk that I followed closely was Faith and one of the good things about watching period dramas based on the real historical figures is the history. Just like what I did with Faith, I spent the whole day yesterday reading about Jang Ok-jung’s biography. I even went to Korean sites for the sake of obtaining more information until my brain couldn’t take it anymore. 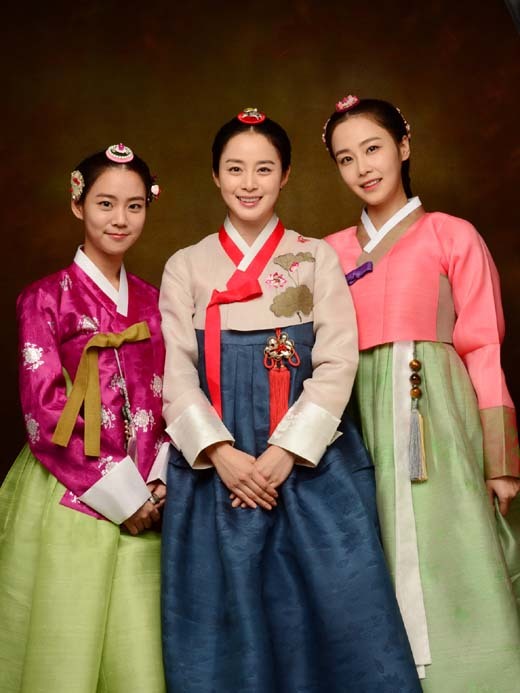 The characters in Jang Ok-jung: Live in Love are probably familiar people among those who watched Queen Inhyun’s Man and Dong Yi, but this time, the story is told from Lady Jang / Jang Hui-bin’s point of view. Since all the dramas portrayed her as the evil concubine of King Sukjong, I find it interesting when this drama intends to show the kind Lady Jang while Queen Inhyun and Choi Suk-bin are the evil and scheming consorts. I think the introduction is self-explanatory and I want to keep the surprise for myself although the history has already mapped the rough plot of the drama. I want to share some interesting tidbits that I found from my reading about the history of Joseon yesterday related to the drama. The more I get to know about the history, I get more curious on how they will twist the plot. King Sukjong, portrayed by Yoo Ah-in in the drama, was born in 1661, making him two years younger than Lady Jang (Kim Tae-hee). In real life, Kim Tae-hee is six years older than Yoo Ah-in. Queen Inhyun (Hong Soo-hyun) was younger than King Sukjong by six years but Hong Soo-hyun is actually five years Yoo Ah-in’s senior. Prince Dongpyeong (Lee Sang-yeob)’s name can only be found in the Korean sources so I had to hunt a bit for his biography. He was King Injo’s grandson from his son with Deposed Lady Jo / Jo Gwi-in and that made him a cousin once removed or cousin uncle to Sukjong. Lady Jang became a lady-in-waiting in the same year of Lady Choi / Choi Suk-bin (Han Seung-yeon)’s birth, which was 1670. Han Seung-yeon is only eight years Kim Tae-hee’s junior. I’m not sure whether we will see Lady Jang become a lady-in-waiting in the drama or not. Jang Hyun (Sung Dong-il), the man responsible in making Lady Jang to enter the palace, was her father’s cousin. Hence, he’s her cousin once removed, or her cousin uncle. Queen Inhyun was actually King Sukjong’s second Queen Consort. His first Queen Consort, Queen Ingyung (Kim Ha-eun), died in 1680 and Sukjong married Inhyun one year after Ingyung’s death. Queen Inhyun’s father Min Yoo-jung was the Minister of Defense. Not sure if we’ll get to see this in the drama, but Queen Inhyun didn’t produce any heir for Sukjong. Lady Jang and Lady Choi both bore a son each that would be the future King Kyungjong and King Yeongjo, respectively. Jae Hee’s character Hyun Chi-soo is a fictional character who’s been harboring one-sided love towards Lady Jang. …and the first episode preview. LOL! You’re so cute, using the live watch as a self control mechanism! ;D I don’t have the discipline to keep up with a live watch so I always feel SOOO behind from not following the live watch! That’s one of the downside of live watching, you got so stay updated with the latest episodes. But the agony of waiting….urgh, even after three years of live watching, I can never recover from the agony of waiting for the next episodes! I'm half hearted about starting L7.. on one hand, so many people were disappointed with it.. but on the other hand.. More Joo Won! Lol! I love that you dug into the history. I always waver on whether I want to know because spoilers versus of course the drama-creators expect their audience to know… But I do find I learn tons of stuff. Most of it from Wikipedia, but it’s better than nothing. Me too! It’ll be like watching a hanbok fashion show and I am so excited for this hanbok feast! I knew the production was just spouting BS when they said that King Sukjong was 6 years younger than Jang Hee Bin… Yoo Ah In looks like Kim Tae Hee’s kid brother. so good watching period kdramas…thanks for all the additional info. i also dig into history to know the real story. i just hope that we all get a nice ending for this drama, from the point of view of jang ok jung. I like JOJ live in love. I think this drama shows us the different view. In other dramas and movies, In hyun and Choi Sook Bin is too good. And it makes people feel faked. Because in concubine, the women have fo fight each other in order to exist. I like Lee Hang in this film. Do you know about Lee Hang’s life and the relationship with Ok Jung in history? do you know about the history of prince dongpyeong? i cant find any. That’s the only thing I found about him. Even for his relationship with the royal family, I had to go through the pages to trace his ancestors..